Line baking tray with a non-stick baking sheet. Peel pineapple. Using a small melon ballet, remove and discard eyes. (I just cut the pineapple skin from top to bottom along each row of eyes). Don’t try to cut off too much of the peel at once or you will take a lot of good fruit with it. Then slice pineapple very thinly, place slices on baking sheet. Cook until tops look dried, about 30 minutes. Flip slices, cook until completely dried, 25 to 30 minutes more. Transfer them to a small muffin pan or egg tray so that the edges curve upward in the shape of a flower. 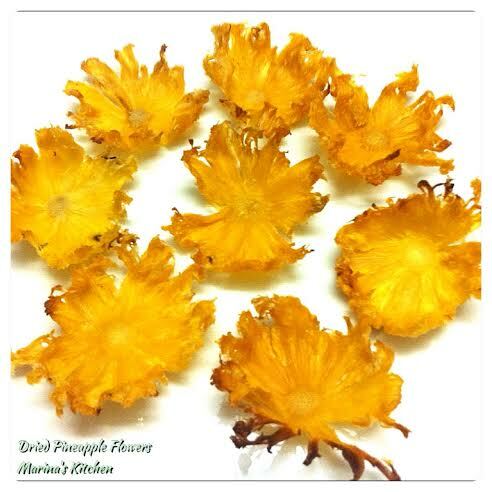 Then place them in the refrigerator uncovered overnight to dry up and retain the flower shape. Store the dried flowers in an airtight container after that.